Roche Bros. will open a supermarket at Arsenal Yards, the project transforming the old Arsenal Mall in Watertown into a major new development with restaurants and a modern movie cinema. The redevelopment is expected to be ready in spring 2019, and will include offices, housing, and restaurant City Works Eatery & Pour House, with indoor and outdoor dining and event spaces, and The Majestic at Arsenal Yards, a seven-screen movie theater with recliner stadium seating and a full bar. The old 1980s Arsenal Mall buildings are being torn down, while the adjacent older, more historical spaces will be renovated for City Works and the Majestic. 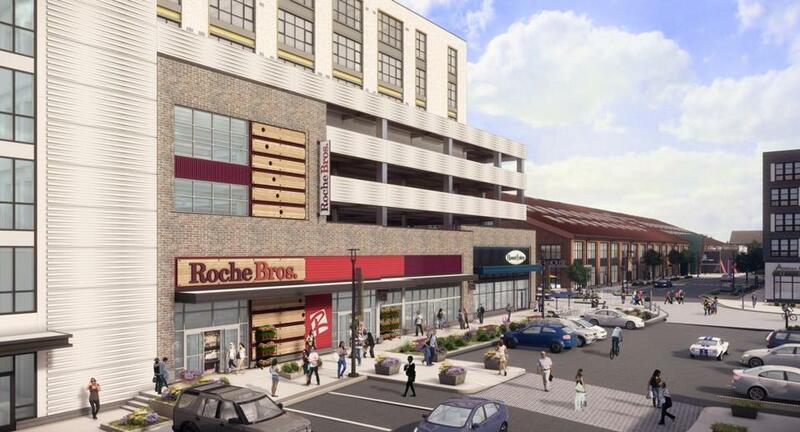 The Roche Bros. will include a “Chop Shop” with fresh cut fruits and vegetables, a grab-and-go lunch counter, deli, and seasonal outdoor produce market, and cafe that will serve espresso drinks. The grocery chain has 18 locations in greater Boston and is also opening a supermarket in Kendall Square, in Cambridge in 2019. Arsenal Yards will also include 500 residences, projected to open in 2020. Apartments will go on the upper floors above retail stores, and condominiums in a separate building. Developer Bill McQuillan anticipates six to eight more restaurants before the project’s completion, and hinted at the possibility of a hotel, too. His firm is co-developing the former mall along with Wilder Cos.